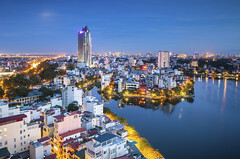 Vietnam is opening wide its doors to Western ideas, culture, and business. Visitors, particularly from Western cultures, are overwhelmed by the sublime beauty of Vietnam's ambiance. The Red River Delta in the north, the Mekong Delta in the south, and almost the entire coastal strip are a patchwork of brilliant green rice paddies tended by women in conical hats. The country is outlined by glorious beaches, while inland there are soaring mountains, stunning monuments and unique architecture. Vietnam offers an opportunity to see a country of traditional charm and rare beauty rapidly opening up to the outside world. The influence of Mahayana Buddhism, Confucianism and Taoism, that were conciliated and Vietnamized, contributed to the development of the Vietnamese society and culture. Traditional Vietnamese music is a diverse mix of native and foreign influences. The greatest influence on traditional music was from the music of China, but later on there was a smaller influence from the music of Champa (previously southern and central Vietnam), which the Vietnamese found intriguing. No other place on earth possesses such an intensity of beauty and strangeness, nor has a longer, richer historical legacy, and few other nations are likely to be as important in the 21st century. Vietnam's culture remains exotic, despite rapid modernization and growing Western influences. 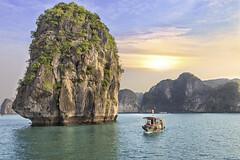 It is now possible to travel to most of the interesting places in Vietnam in a style not dreamed of ten years ago, or barely possible five years ago. 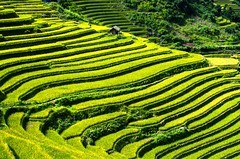 Vietnam travel is a mobile feast of sights and sensations, new and old. The interest by the Vietnamese in Western culture is such that an American orchestra, choir or concert band can captivate a large and enthusiastic audience no matter where it performs. Imagine your musical group performing in the Hanoi Opera House, an ancient city square, at a major Vietnamese music conservatory, a cultural center auditorium, or sharing cultures through musical through exchanges with local Vietnamese musicians!